Be the first to share your favorite memory, photo or story of Gayla. This memorial page is dedicated for family, friends and future generations to celebrate the life of their loved one. Gayla Ann Hastings, 58 of Lawndale and Morganton went to be with her Lord and Savior on April 12 at Atrium Health in Charlotte. She was surrounded by her loving family. Ann was born on August 11, 1960 to Bill and Patsy Peeler Hastings of Lawndale. Ann is survived by her faithful and dedicated parents, Bill and Patsy Peeler Hastings. Also surviving are her brother Gary Hastings and wife Lori of Shelby and her sister Tami Rayle and husband Dwayne of Shelby: two nephews Garrett Hastings and Brandon Rayle, fiance Lexi Poston and two nieces Laura Hastings Allen, husband Derek, and Breanna Rayle; great nephew Austin Allen. 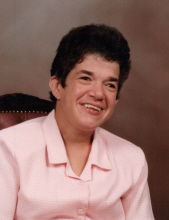 Ann was a resident of the J. Iverson Riddle Developmental Center formally Western Carolina Center for nearly 50 years. Ann enjoyed life and will be missed dearly by her family and friends. The family would like to express their gratitude to all the staff of the J. Iverson Riddle Developmental Center for the excellent care and compassion shown to Ann over the years. Ann enjoyed special family dinners, weekend visits with her parents, being a part of the congregation of Casar Baptist Church and time spent with her friends at the center. The family will receive friends at Casar Baptist Church from 1:00-2 :30 on Monday, April 15. The funeral service will be held at 3:00 with the Pastor Doug Pruett and Dr. Rit Varriale officiating. Burial will follow in the church cemetery. In lieu flowers, memorial donations may be made to Casar Baptist Church Cemetery Fund, C\O Larry Carpenter, 948 Oak Grove Clover Hill Church Road, Lawndale, NC 28090. To send flowers or a remembrance gift to the family of Gayla Ann Hastings, please visit our Tribute Store. "Email Address" would like to share the life celebration of Gayla Ann Hastings. Click on the "link" to go to share a favorite memory or leave a condolence message for the family.